Year after year, thousands of Central Florida foodies and philanthropists gather to get a taste of the delectable creations of our region’s top chefs at United Way’s signature fundraiser, Chef’s Gala. With fine wines to accompany the beautiful dishes, live entertainment and a silent auction benefiting United Way’s community programs, Chef’s Gala is a “tasteful way to make a difference.” Thanks to our generous host & title sponsor Walt Disney World, presenting sponsor Florida Technical College and other sponsors, 95 cents of every dollar raised goes directly to help those in need. To whet your appetite for the 2015 Chef’s Gala, we’re excited to share our 2015 participating establishments! It’s never too early to get your tickets to Chef’s Gala. Individual tickets are $275 and a Couples Package is $500. Corporate packages and sponsorships are also available. To learn more or purchase your tickets, visit www.ChefsGala.org. The day that Jenny Gibson-Linkh, principal at Evans High School in Orange County, discovered a student washing her clothes in the bathroom sink after school was the day she realized that clothing was a significant need among her homeless students. It’s estimated that more than 10,000 students in Orange and Osceola counties are homeless and are faced with many challenges – both personally and academically. In October 2014, Heart of Florida United Way launched Dress2Learn, a clothing program for homeless students in Orange and Osceola counties. As a result of the program this year, more than 5,400 homeless students across 250 schools received new Levi’s brand apparel. Jeans, khakis, shorts, polo tops and graphic tees were distributed to K-12 children in need. Not only is it about attendance and performance in school, but it’s also about relieving the financial burden of purchasing clothing for growing kids. Evans High senior Romicha Baker was one of the 5,400 recipients of the Dress2Learn program. Not only did Dress2Learn provide Romicha with a new set of fitting clothes, but also a renewed sense of hope. It’s easy to see the interconnectedness of United Way’s focus areas – education, income, health and basic needs – through Dress2Learn. A balance must be achieved in all four of those areas for stability. Although, United Way believes that education is the change maker: get kids to focus in school, they may be able to break the cycle. And sometimes, it’s something as small as a new t-shirt to get them there. 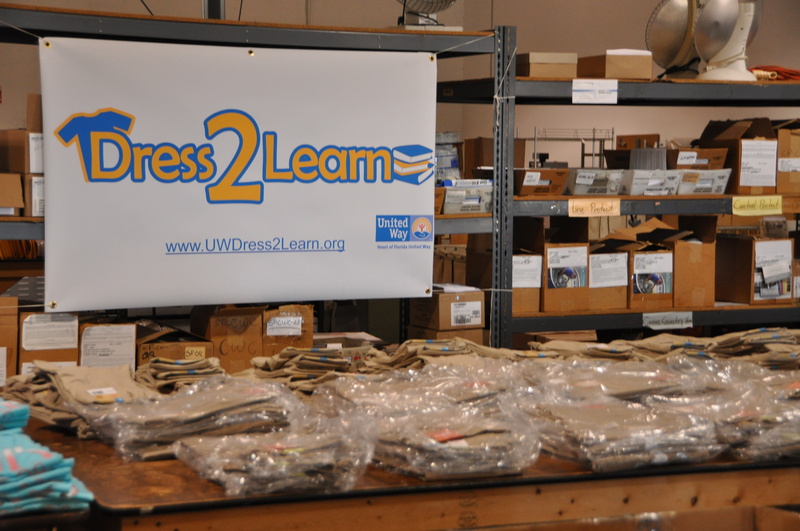 To learn more about ways you, your company or organization can get involved with Dress2Learn, visit UWDress2Learn.org. Just $50 can supply one homeless child with a full complement of school clothes. Fundraising for the program is year-round, so your help is always needed and welcomed. Thank you! On any given night in the United States, approximately 643,067 people experience homelessness. One of Heart of Florida United Way’s focus areas is alleviating hunger and homelessness for residents in Orange, Osceola and Seminoles counties. 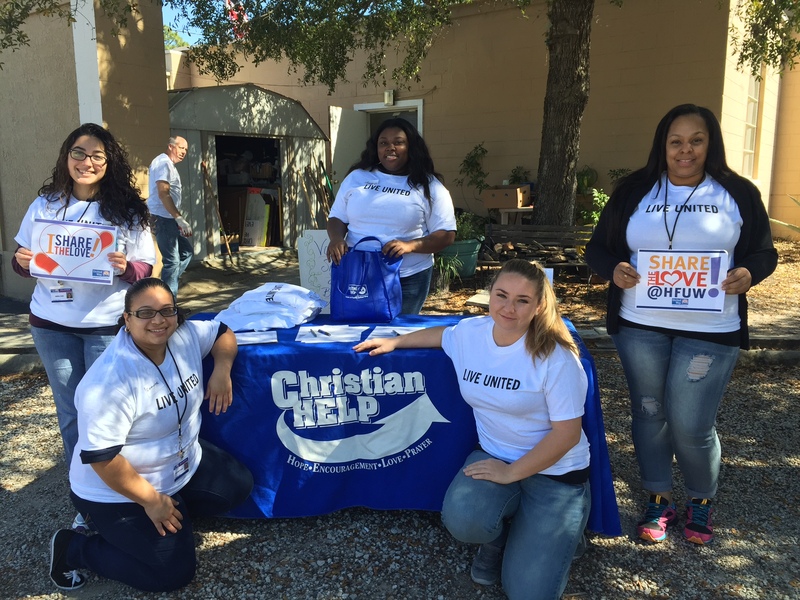 This Valentine’s Day, the Heart of Florida United Way’s Volunteer Resource Center called on volunteers to share the love to fight hunger and homelessness. The 2nd annual day of service allowed volunteers to fill hearts with gratitude and little bellies with food through a variety of projects including sorting food donations at Second Harvest Food Bank, serving a meal to homeless families with Salvation Army, putting together weekend snack packs for low-income elementary students to take home, and decorating for Orlando Day Nursery’s Sweet Tart Dance. “Thanks to the volunteers from United Way, our children not only enjoyed the Valentine’s Day Sweet Tart Dance, but also learned about their body’s most important muscle, the heart. United Way volunteers help children listen and feel their heart beat, learn how it pumps blood, and learn about the four ventricles,” said Mata Dennis, executive director of Orlando Day Nursery. We would like to thank our awesome volunteers for helping to make this event such a huge success! On behalf of our partner agencies who benefitted from your generosity, thanks for sharing the love! Check out photos from the event on Facebook or Google+. Got lunch plans on Wednesday? We’ve got spirit! Yes, we do! We’ve also got tacos… How about you? 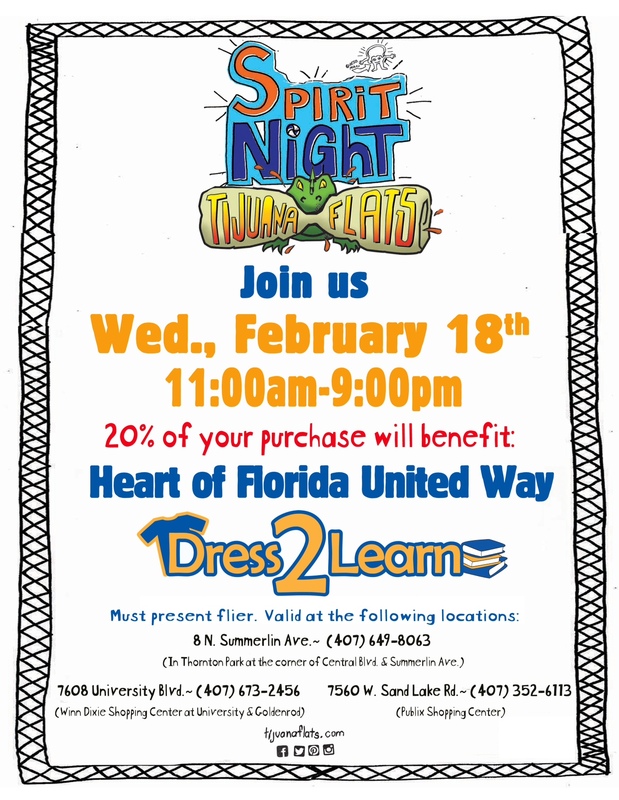 Tijuana Flats is hosting a Spirit Night benefiting United Way’s Dress2Learn, a clothing program for homeless students. Generously, 20% of proceeds from customers who bring in the flier below to one of the three locations on Feb. 18 (11 a.m. – 9 p.m.) will be donated to Dress2Learn. Stop by with your colleagues or family to pig out and pitch in to help homeless children in Orange and Osceola counties. Can’t make it out? Share on Facebook or Twitter to let your network know! Roses are red. Violets are blue. Volunteering is fun! And it warms your heart, too. 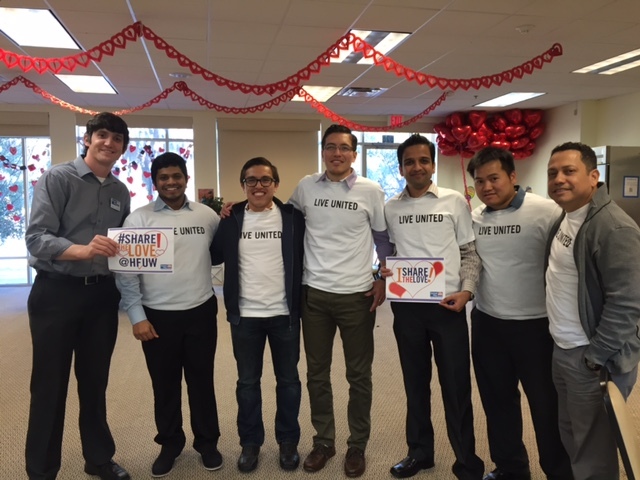 United Way invites you and your significant other, co-worker, friends or family to Share the Love this Valentine’s Day. Add to your bouquet of Valentine’s Day fun by bringing a smile to a neighbor’s face. Dozens of projects will be scattered throughout Orange, Seminole and Osceola counties to help individuals and families affected by hunger and homelessness. Join in making a difference in the lives of others on Friday, Feb. 13. Click here to view available projects and sign up. Check out some photos from last year’s event. Basics for Babies items being sorted by McGladrey volunteers. Hundreds of packages of wipes, diapers, formula and other infant essentials are being sorted and boxed as Heart of Florida United Way wraps up its annual Basics for Babies supply drive. This community-wide effort benefits at-risk mothers struggling to provide basic care items for their infants. The drive, which launches in October, calls upon local businesses, churches and social groups, to set up drop-off locations for a fairly short list of items. Requested items include diapers, wipes, formula, new infant clothes, blankets and baby books. • Help Now of Osceola, Inc.
• Heart of Florida United Way Emergency Homelessness Services. The cost of diapers alone is a hardship for lower income mothers. At least one study estimates that a single working mother earning minimum wage would spend more than 6% of her gross income on diapers alone. Basics for Babies helps to provide much needed relief for these families, and it helps keep babies healthier as it prevents mothers from being forced into re-using diapers. The estimated fair market value for everything collected during the 2014 drive is $13,853.92. The phrase “working poor” can elicit images of someone who is severely under-employed and living at the federal poverty line. But a new report released by United Way says not only is that picture inaccurate, the phrase “working poor” is inaccurate. Developed by Rutgers University, the report calls attention to a population it refers to as ALICE, an acronym for ASSET LIMITED, INCOME CONSTRAINED, EMPLOYED. Set aside the jargon, and what’s being talked about are workers, some with families, who earn either just enough to get by, or are not quite making ends meet. These are everyday people who hold jobs as hospitality workers, daycare teachers, landscapers and so on. Their incomes simply don’t meet the cost of living. More than 203,000 tri-county households fall into what United Way calls the ALICE population. These are households earning more than the official U.S. poverty level, but less than the basic cost of living. This is more than double those considered in poverty by federal standards, which accounts for over 101,000 households in Orange, Seminole and Osceola counties. Combined, ALICE and poverty households, account for about half of all households in Central Florida. According to the United Way ALICE report, 45 percent of Florida households are struggling to afford food, housing, childcare and transportation. However, a closer look at local numbers tells an even stronger story of hardship. • Nearly 50% of Central Florida families do not earn enough to consistently cover the basic living expenses highlighted by the ALICE Threshold. • 69% of all jobs in FL pay less than $20 an hour and most pay between $10 and $15 an hour. The jobs forecast shows that low-skill and low-paying jobs will dominate Florida’s future if the economy continues on its current trajectory. • Of the ALICE population in Osceola County, 47% are homeowners and 1/3 of homeowners are cost burdened (pay more than 35% of their income on their mortgage). Likewise, in Orange County 39% of the ALICE population owns homes, with 29% cost burdened; and in Seminole County 34% own with 27% cash burdened. • A significant majority of households below the ALICE threshold rent (69% Orange County, 62% Seminole County, 71% Osceola County). Approximately half of all renters are cost burdened (pay more than 35% of their income on their rent). • Central Florida needs more than 95,000 affordable rental units to meet the current demand for affordable homes, with more than 65,000 of those needed in Orange County. • Florida became less affordable from 2007 to 2012. Despite the Great Recession the cost of basic housing, child care, transportation, food and healthcare increased by 13%. • Orange, Seminole and Osceola counties all rank in the bottom 1/3 of counties in Florida for overall housing affordability, with Orange County being the 4th worst in the state. • Orange, Seminole and Osceola all rank in the top 1/3 of counties in Florida for job creation. This is a population that United Way has been serving for over 75 years, but this new report sharpens the focus on the overall economic health of our community, which could ultimately lead to improvements for ALICE. Awareness can bring business and community leaders together to find workable solutions to affordable housing, affordable childcare, affordable healthcare and access to transportation that can help bring incomes more in line with the cost of living. United Ways in six states commissioned Rutgers University-Newark, School of Public Affairs and Administration to conduct the ALICE research. The report was funded by grants from AT&T, Atlantic Health System, Deloitte, FamilyWize, Novartis, Post Foods, and The UPS Foundation. You are currently browsing the archives for the Alleviating Hunger and Homelessness category.